Pellerin Milnor Corporation has announced the retirement of Regional Sales Manager Sam Kielman III. Sam was first introduced to the laundry industry in 1972 after graduating from Texas A&M University with a BBA in Marketing. 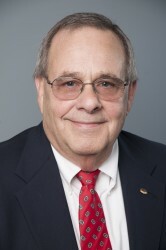 He then came to Milnor in 1988 as a veteran of the laundry industry, having previously served as the Production Manager for Chalmette Linen - New Orleans, Assistant Production Manager for Ineeda Linen - Houston, West Coast Regional Sales Manager for Artex International, Sales Associate for Systemation Inc., and Senior Project Manager for Baring Industries. Throughout his 29-year career with Milnor, Sam traveled across North, South and Central America, as well as the Caribbean, managing several dealers throughout the two continents. Looking back on his time with Milnor, he is thankful "to have had the opportunity of working with some of the best laundry equipment distributors across the Western Hemisphere while representing a major manufacturer in the laundry industry," also noting that once he joined the Milnor sales team, he "never looked back or questioned [his] decision." "Sam's knowledge and experience has been invaluable in the area of sales and strong customer relationships," says Rick Kelly, Pellerin Milnor Vice President of Sales & Marketing. "We are grateful for his service to Milnor and we wish Sam and his wife Carol all the best in his well-deserved retirement." Upon retiring, Sam is most looking forward to moving back home to Texas where he plans to spend time with his family and cheer on the Texas A&M Aggies.